Pienza is a town and comune in the province of Siena, in the Val d'Orcia in Tuscany, between the towns of Montepulciano and Montalcino. Pienz is often called the "touchstone of Renaissance urbanism." In 1996, UNESCO declared the town a World Heritage Site, and in 2004 the entire valley, the Val d'Orcia, was included on the list of UNESCO's World Cultural Landscapes. 'In February 1459, the Humanist Pope Pius II (Enea Silvio Piccolomini) paid a visit to Corsignano, his native village, and decided to change it into an ideal city to be called Pienza, the city of Pius. Within three years, the Piazza Pio II would be enclosed within a group of buildings that included the cathedral, a papal palace, a city hall, and a bishop's palace. Leon Battista Alberti, one of the most famous architects of the period, took part in the visit and gave advice to the Pope, but the task of designing and constructing the ideal city was given to Bernardo Rosselino (1409-1464). Rosselino was a distinguished architect in his own right and was also the architectural executant for Alberti on the Palazzo Rucellai in Florence (1447-1451). The pope, who was keenly interested in architecture, engaged with Rosselino in a process of intense collaboration. In the center of the village, at the end of a main street that measures just under 1,000 feet in length, Rosselino created a town square such that the approaches from the intersecting side streets would be visually attractive. Rosselino treated the square, or piazza , 90 by 80 feet, as if it were an interior room with walls created by the façades of the cathedral and the three surrounding buildings. For Rosselino, town design was simply an extension of architecture. He designed the piazza/room as a strict exercise in perspective, organizing the pavement as a horizontal grid and the building façades as vertical grids, like those that would be used in constructing a perspective drawing of the square. The pattern of the rectangles implied by the grid identify the mathematical rules used in creating the proportions for all aspects of the piazza. This sort of construction conformed to Alberti's theories. Rosselino treated the façade of the cathedral like a Roman triumphal arch . The plan of the church, like that of the piazza, is square, so that volumes of church and square are nearly comparable, the piazza being an "open room" and the cathedral an enclosed room--a "covered square." Pius, who had developed an interest in Late Gothic Austrian church design when he was apostolic secretary and ambassador, chose to build Pienza cathedral as a German "Hallenkirche," a church with nave and side aisles of the same height. To the right of the cathedral, the Pope's Palace, called the Palazzo Piccolomini, was designed by Alberti and built by Rosselino. It closely resembles the Palazzo Rucellai, which the same pair built in Florence. The façade is built of mellow ocher stone with all details organized by the dominant rectangular grid. Windows in the upper stories are bipartite, that is, divided in two by a central column and framed by a thick, round arch at the top and two pilasters to the sides. Two strong horizontal stringcourses resembling classical entablatures divide the three stories and the palace is topped by a powerful cornice . The module of the bifurcated window between pilasters is repeated on the walls, giving a visual density to the palace block. Like Florentine palaces, there is a square interior courtyard, from which a gallery leads to a planted terrace that overlooks the immensity of the surrounding landscape. Analogous to the piazza-church pairing, the area of the terrace-garden is equal to the ground plan of the palazzo, creating a similar case of open versus closed volumes. To carry the open/built comparison further, the piazza, the cathedral, the palazzo, and the terrace-garden are all comparable in size, and they oblige us to consider and to understand the way in which they were combined by Rosselino. The Bishop's Palace and the town hall are simpler than the other two buildings and they follow Tuscan tradition. The façade of the town hall opens into a lovely Ionic gallery. Although the mixture of different architectural styles may be surprising, it actually reflects the flexibility of Renaissance design. A closer look at the space of the piazza reveals that the walls of the Palazzo Piccolomini, the bishop's palace opposite, the town hall, and the cathedral are not perpendicular to each other. As at Michelangelo's much later Campidoglio in Rome, the buildings create a trapezoidal plan for the piazza, in effect reversing the normal perspective sense of parallel lines appearing to converge. The effect is to make the façade of the cathedral seem larger than the façade of the papal palace, which is in fact the larger of the two buildings. Furnari, Michele. Formal Design in Renaissance Architecture from Brunelleschi to Palladio. New York: Rizzoli, 1995. 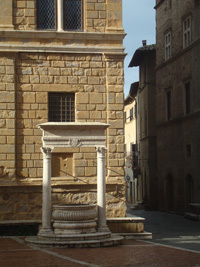 Mack, C. R. Pienza: The Creation of a Renaissance City. Ithaca, NY: Cornell University Press, 1987. Adams, Nicholas (May 1985). "The Acquisition of Pienza, 1459-1464". Journal of the Society of Architectural Historians. 44 (2): 99–110. Jean Castex is an architect and professor of architectural history at the Versailles School of Architecture, where he has served as president of the faculty. He has published several books and articles on urban studies, including Urban Forms, the Death and Life of the Urban Block (1977), and Renaissance, Baroque, Classicisme, 1420-1720. Covering all regions of Italy - from Turin's Palace of Labor in northern Italy to the Monreale Cathedral and Cloister in Sicily - and all periods of Italian architecture - from the Colosseum in Rome to the Casa Rustica apartments built in Milan in the 1930s - Architecture of Italy examines over 70 of Italy's most important architectural landmarks. Sources: Wikipedia, the free encyclopedia, La Foce, and Holly Kerr Forsyth, Gardens of Eden | Among the World's Most Beautiful Gardens, Melbourne University. La Foce is a large estate that lies close to the towns of Montepulciano, Chiusi, and Chianciano Terme in the Southern Tuscan region of Val d'Orcia. Centered around a 15th Century villa, the estate was restored by Iris Origo and Antonio Origo in the 1920s. The gardens are designed by the English architect, Cecil Pinsent, who also designed the gardens at Villa Le Balze. 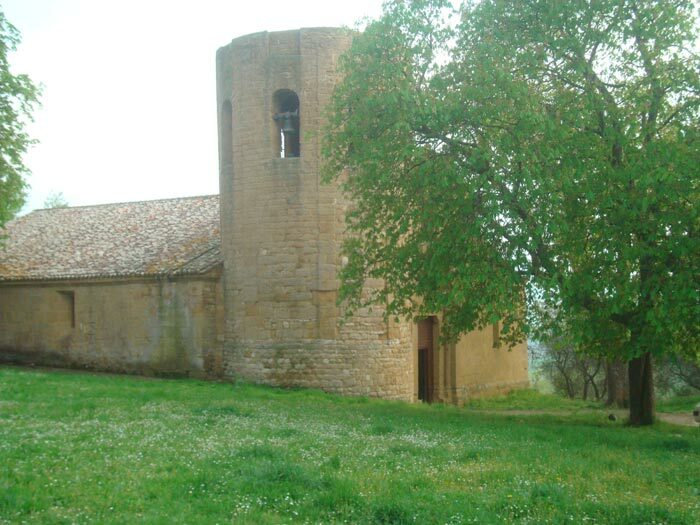 The book War in the Val D'Orcia by Iris Origo is set in this estate. 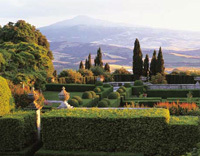 La Foce, near the Tuscan village of Chianciano Terme, close to Siena, is considered Pinsent's most important postwar garden, and with it his design career entered a new and vibrant stage. His client, Marchesa Iris Origo, was gardening aristocracy: her mother was the American heiress Lady Sybil Cutting, who bought the 15th-century Medici Villa in Fiesole overlooking Florence in 1911 , Iris married the Marchese Antonio Origo in 1924 and bought 100 hectares of somewhat eroded land and its rundown building with a dramatic view of Mount Amiata and the valley of the Orcia River. Over 15 years, Pinsent and his colleague, designer Geoffrey Scott (who later married Sybil Cutting), along with the Origos, created the many-layered gardens that are today superbly maintained by their daughter Benedetta Origo. La Foce is a garden of formal enclosures, squares and rectangles, edged in low box hedges and walled with clipped evergreens - all overlaid with exuberant plantings. The gardens unfold, on several levels, from the ochre-washed house, first to the sunken Iimonaia or citrus garden, then - by staircases of mellow stone - inexorably south, towards that extraordinary vista. Great use is made of long walkways and pergolas to lead from one compartment to the next, to create boundaries and provide a coat-hanger for climbing roses and wisteria. Cypress trees were frequently planted along roads to commemorate the dead from wars.But the trees on this road were planted by Iris Origo from La Foce to make a nice view from her house and gardens. The famous road lined with cypress is just southeast of Monticchiello, a small town south of Pienza, overlooking the Val d'Orcia.The urban structure of the town is well preserved and you get a strong feeling for rural and agricultural life of the past 800 years. Visit the new Museo del Teatro Popolare Tradizionale Toscano or Theatre Museum of Popular Tuscan Tradition, but especially the Teatro Povero. Written and performed by the inhabitants of Monticchiello, Teatro Povero looks at the past, present and future life of the town. The Maremma spreads in southern Tuscany. It is a still wild region where ancient traditions survive in pure nature. To sea lovers, the Maremma offers kilometres of sandy beaches, small bights and crystalline sea where to scuba dive at the discovery of the animals and plants living in this corner of paradise. The Maremma is not only synonym with beach and sea: the Maremma is also art, history and culture, with the Etruscan cities of Populonia, Vetulonia and Roselle and its numerous hamlets and castles; the Maremma is also health and well-being, with the spas in Saturnia; and to mountain lovers, the Maremma offers the possibility of hiking on the mount Amiata. Podere Santa Pia, a 19th century stone house has been carefully and beautifully restored with tiled floors, beamed ceilings, the internal stone and wood structures an the the wood-burning inside pizza-oven. The villa is located approximately 2,5km from Castiglioncello Bandini and is divided into two units, each enjoying private gardens and terraces. Santa Pia is set in an extremely panoramic spot, dominating over the valleys, the countryside, up to the Tyrrhenian coast. For those seeking a peaceful, uncontaminated environment, yet be just a short drive from some one of Tuscany's most intoxicating cities, Santa Pia is the perfect choice. The surroundings of Podere Santa Pia, cypress trees in San Quirico d'Orcia between Montalcino and Pienza . The cypress tree has become the symbol of the Val d'Orcia.